The Faculty of Law is delighted to announce the appointment of Professor Danwood Chirwa in the role of Dean of Law, with effect from 1st January 2019. Many of our alumni will know, and have been taught by, Professor Chirwa who is no stranger to the Faculty, and brings with him a wealth of experience and expertise in teaching, research and university administration. To provide some insight into Professor Chirwa’s career and achievements, we include a brief bio below. 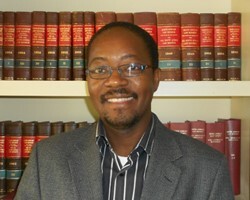 Professor Danwood Mzikenge Chirwa holds a PhD from the University of the Western Cape, an LLM from the University of Pretoria, and an LLB (Hons) from the University of Malawi. Currently, he holds a full professorship at the University of Cape Town. Over the last 14 years, Prof Chirwa has taught Administrative Law, International Human Rights, Children's Rights, and Constitutional Law. He has played a key role in curriculum development and the administration of the human rights post-graduate programmes and has gained considerable experience as a postgraduate supervisor at both the LLM and doctoral levels. Rated by the National Research Foundation as an internationally acclaimed researcher (B3), Prof Chirwa's research has largely focused on normative frameworks and institutional mechanisms for the protection of the rights of vulnerable groups such as the poor and children. His research has increasingly also focused on models of domestic implementation of certain specific rights. He has promoted Africa-focussed legal research and worked with leading and emerging academics on the continent. His major publications include Human Rights under the Malawian Constitution (Cape Town: Juta & Co Ltd, 2011) 555; DM Chirwa & Lia Nijzink (eds) Accountable Government in Africa: Perspectives from Public Law and Political Studies (Cape Town: UCT Press/United National University Press, 2012); DM Chirwa & L Chenwi (eds) Judicial Enforcement of Economic, Social and Cultural Rights in Africa: International, Regional and Domestic Experiences (Cambridge: Cambridge University Press, 2016). Prof Chirwa has served the Faculty and University in various capacities including as Deputy Dean for Postgraduate Studies (from October 2018), Acting Dean of the Faculty of Law (1 April and 30 June 2014), Head of the Department of Public Law (1 July 2009 and 31 March 2014, and 1 January - 30 September 2018). He regularly participates in the University's disciplinary processes for academic and administrative staff and as Senior Proctor for the student's disciplinary system. Prof Chirwa has also played a key role in the mentorship programme of the faculty both as an academic and as Head of the Department of Public Law. Prof Chirwa has acted as external examiner for various public law undergraduate and postgraduate courses for many universities. He has also been called upon to serve an external reviewer of the undergraduate curriculum in law of at least two universities. He has also served on the editorial or advisory boards of a number of respected journals and regularly reviews submissions for local and international journals. In addition, he regularly reviews book manuscripts for internationally recognised publishers. Over his career, he has practised law and, as an academic, worked closely with a wide range of civil society and international organisations in South Africa, Africa and beyond. Currently a member of the Board of Trustees of the United Nations Voluntary Trust Fund on Contemporary Forms of Slavery, Prof Chirwa has served on the boards of directors of the RAPCAN (2008-2017); the Open Democracy and Advice Centre (ODAC, 2006-2009) and the Socio-Economic Rights Institute (2010-2013), and as Secretary-General of the African Network of Constitutional Lawyers (2007-2008). Prof Chirwa has also worked or collaborated with international and Africa-based NGOs and research centres such as Rights and Democracy (Canada), Halifax Initiative (Canada), the Community Law Centre (South Africa), the African Child Policy Forum (Ethiopia), ESCR-Net (USA), the Southern African Human Rights Trust (Zimbabwe), IDASA (South Africa), and the Centre for Human Rights and Rehabilitation (Malawi).